Words from Ray F. Galli Jr.
Where it all began: the first Galli business office. Galli's first floor plan; Hand drawn in the 1920s. 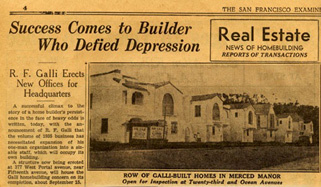 Galli became well known through a reputation for building the best quality homes at a fair price. After becoming known for building high quality homes Galli began building entire neighborhoods and subdivisions. This San Francisco example is from the 1920s. Text Version Easier reading of a 1935 San Francisco Examiner news article. Full News Page Interesting reading; note large advertisement by Galli (200 kilobytes). Galli's 2nd office building (referenced in the above news article) was located at 377 West Portal in San Francisco, and construction was completed in 1935. It is now occupied by a few doctors and other professionals. Ray Galli Jr. joined the business. Read his story of the company over his lifetime. A Galli Gift Calendar from 1940. Ray Galli's father imigrated form Italy and opened a produce store. Garry Losk joined the firm in the 1970s and is now at the helm. Read is story.